A perfect way to show your love on Raksha Bandhan, this Pretty Decorative Basket Hamper complemented with a free Rakhi, Roli Tilak and Chawal, will add an auspicious charm to the day. 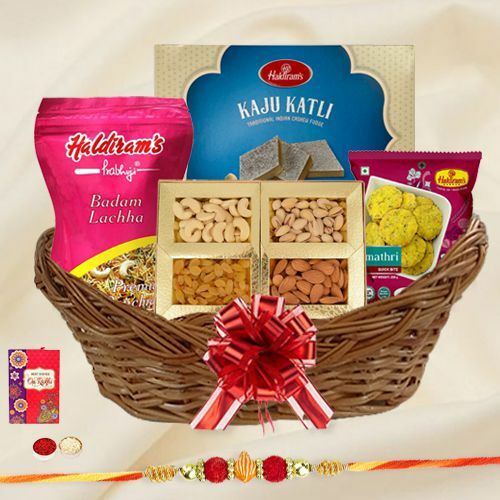 This Basket is loaded with Assorted Dry Fruits (200 gms), Haldiram Kaju Katli (200 gms), Haldiram Badam Lachha (200 gms) and Haldiram Methi Mathri (200 gms). There might be a slight change in the displayed design of Basket.